The best thing about living in London is whatever type of food you are after, you'll find it. 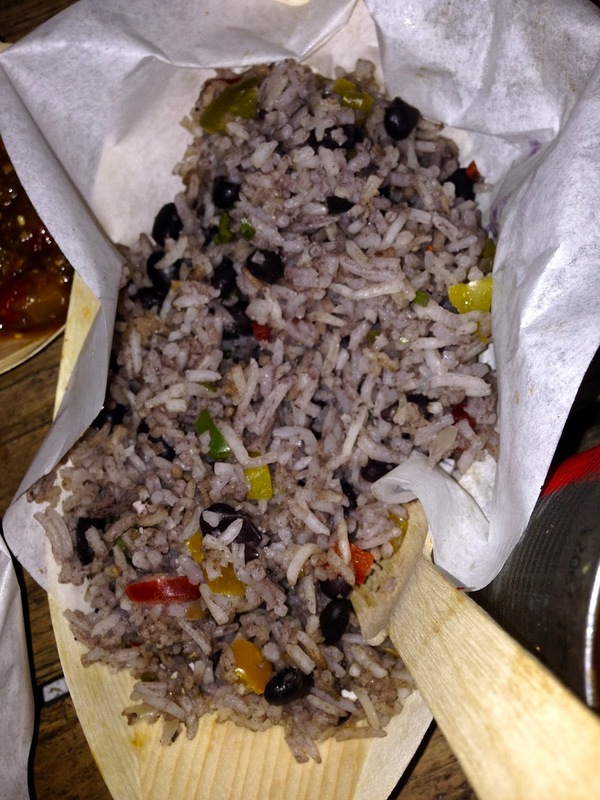 Which was perfect for a very hungry, slightly tipsy trio of friends on Friday night with an appetite for some good, traditional Caribbean cooking…and we knew exactly where to go. 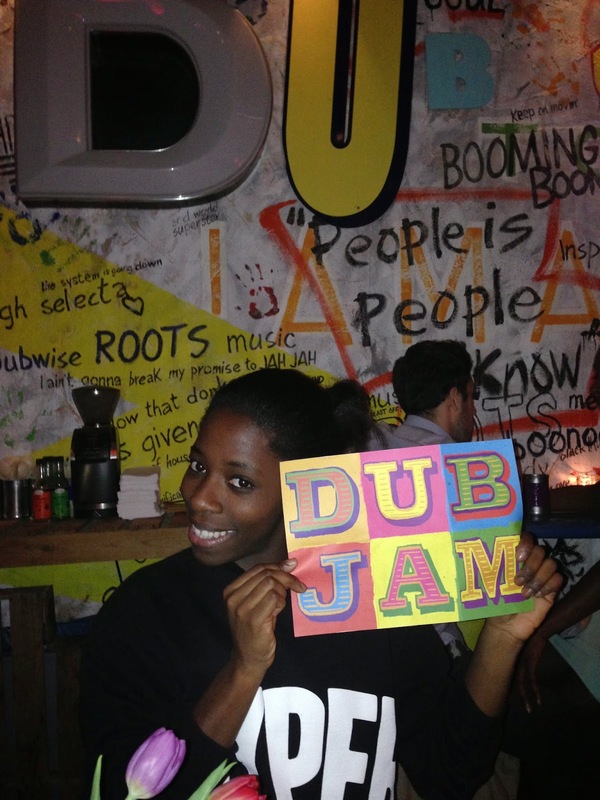 We were in Covent Garden and made a bee-line for Dub Jam, a fab little hideaway on Bedford Street which has had some great reviews. It seems we timed it perfectly too, we got there about 9.30pm and were seated at the table right by the kitchen, sharing with another couple as the seating is quite sparse. It sits about 20 I'd guess but it didn't matter at all, it all just added to the feel good vibes of the place. 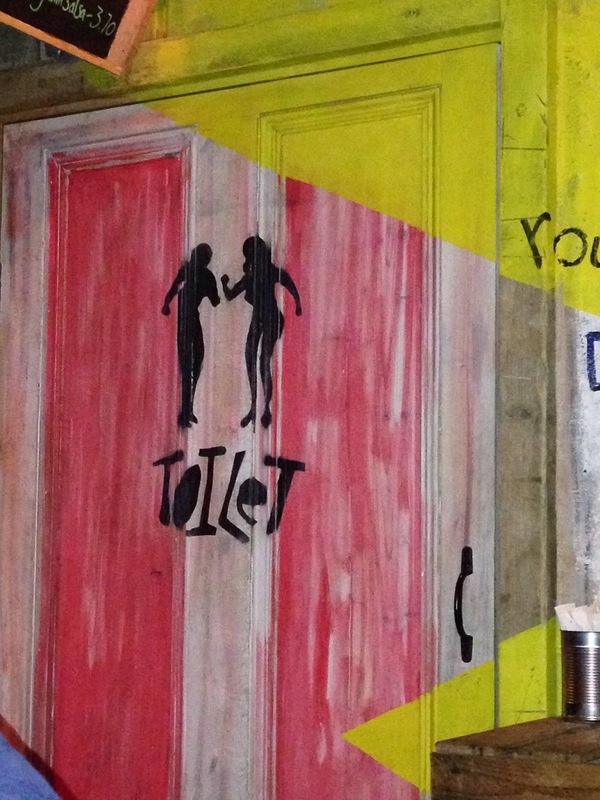 I'd heard from a friend that the inside had been decorated on a bit of a budget, but again it just added to the charm. 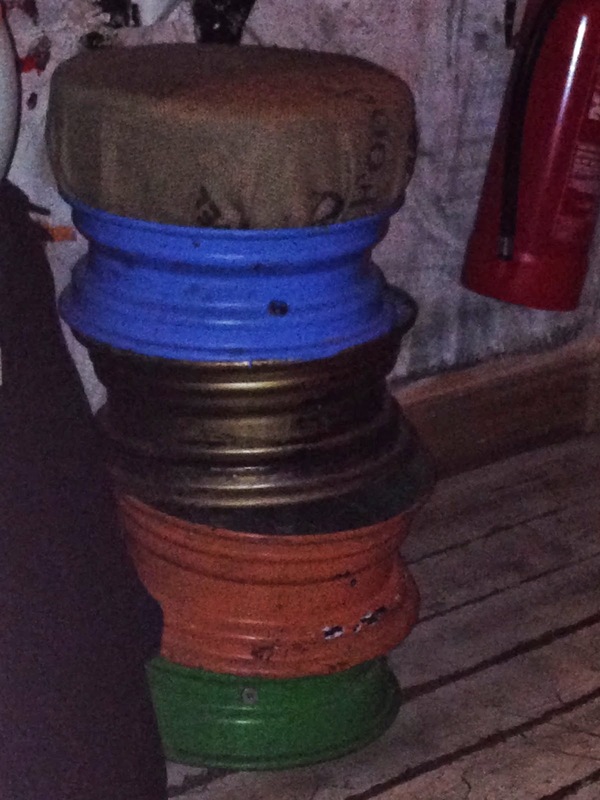 Crates and tins for chairs and tables, old surf boards and they'd even upcycled old shop signs. The D is the MacDonald's D, the U the Subway U and the M from Monsoon. 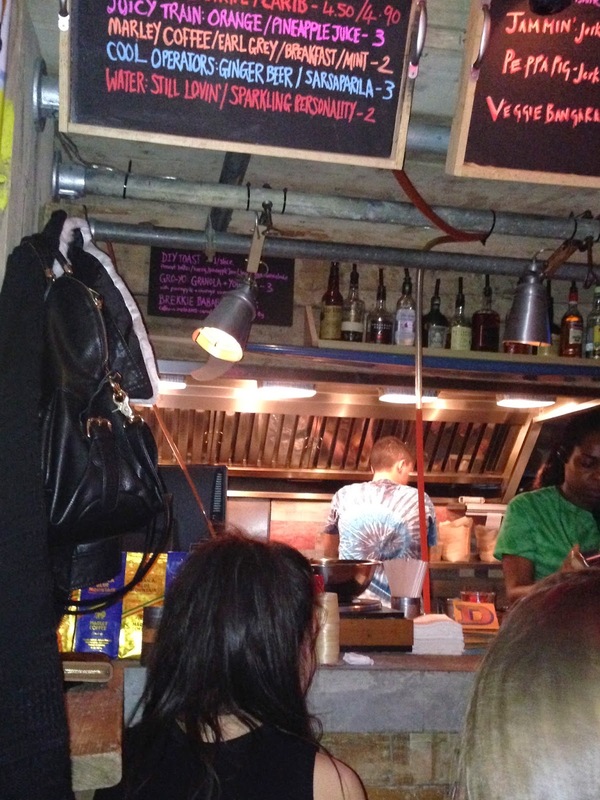 All of which sat artfully on top of decorated graffiti wall with sayings, motto's and random words from the Caribbean. Even in the toilet they had soap in a sprite bottle, which wouldn't work anywhere else, but I absolutely loved the quirkiness. It all just worked. After we sat down, the waiter came over to us and asked if we'd been before; "No" we all giggled (what is it about a couple of cocktails and being with your chicas that makes any question you're asked so funny?) so he proceeded to tell us all about the menu. There is a choice of skewers, burgers or curry. We all made up our minds then and there that it was all about the skewers. 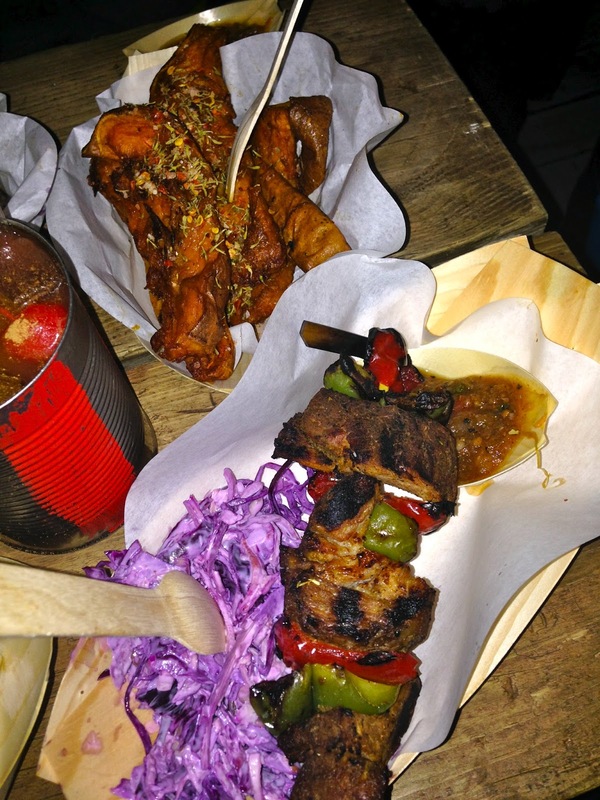 A mix of Jerk Chicken and Jerk Pork, with sides of 'Rice and Peace' and sweet potato, plus a round of Rum Punch. 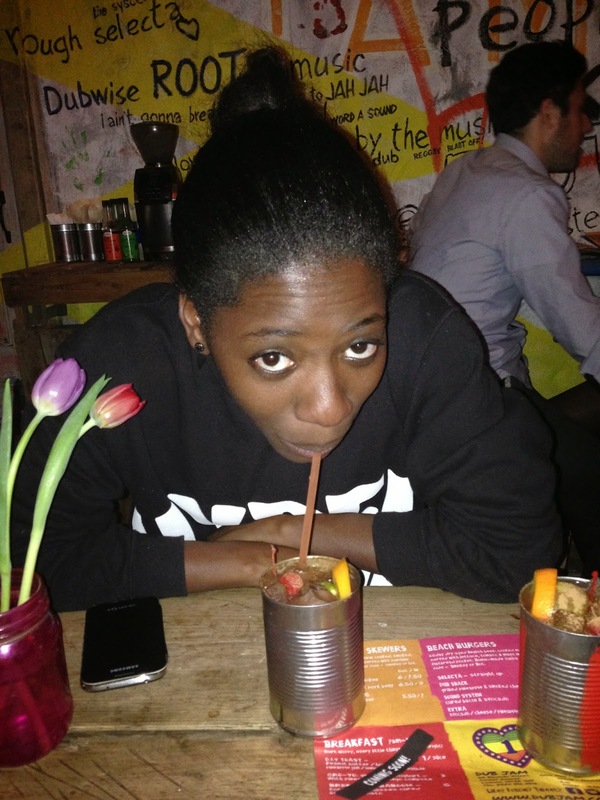 The best thing about this rum punch (besides the lethal quantities of rum and Wrey and Nephew) was the way it's mixed. Dub Jam actually infuses it's punch mix with reggae music. They literally ferment the punch in their sound systems, using a tube to pour it into tin cups. 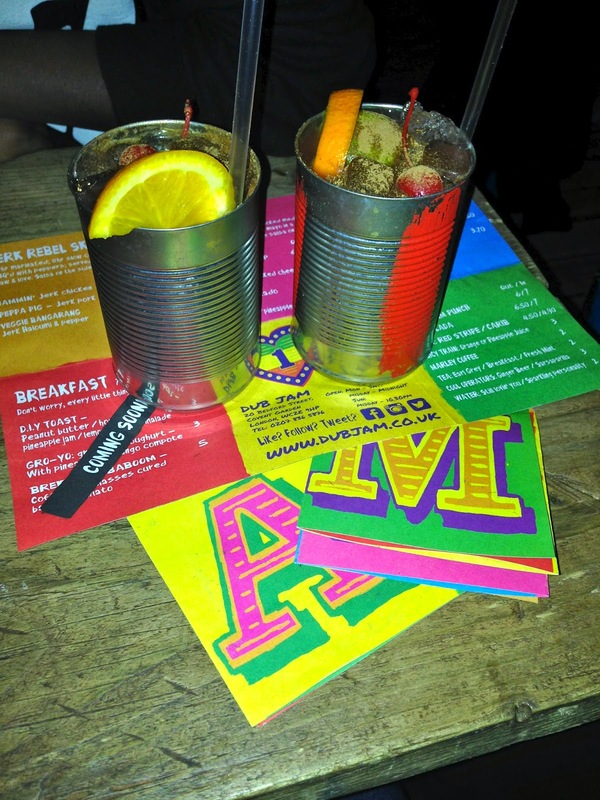 When we ordered, Bob Marley 'No Woman No Cry' was playing and Yvette behind the bar actually said to us these were going to be 'some nice drinks here gals, they are infused with the king of reggae'. Now, I'm not sure if it was Bob Marley serenading our fruity concoction or the blend itself, but whatever it was, it worked. Potent yet perfect, those punches went down a treat. And it wasn't long until our food arrived either. Beautifully glazed Jerk Chicken and my gosh, was this some of the best sweet potato I have EVER tasted in my life. It melted in the mouth and had that barbecue flavour to it that meant it went down a treat! But being us, and liking to have a laugh and a joke with the team, we also asked them about their spices and the guys bought over one of their hottest sauces for us to try. Sharna being the only one brave enough to give it a go also said it was really nice. 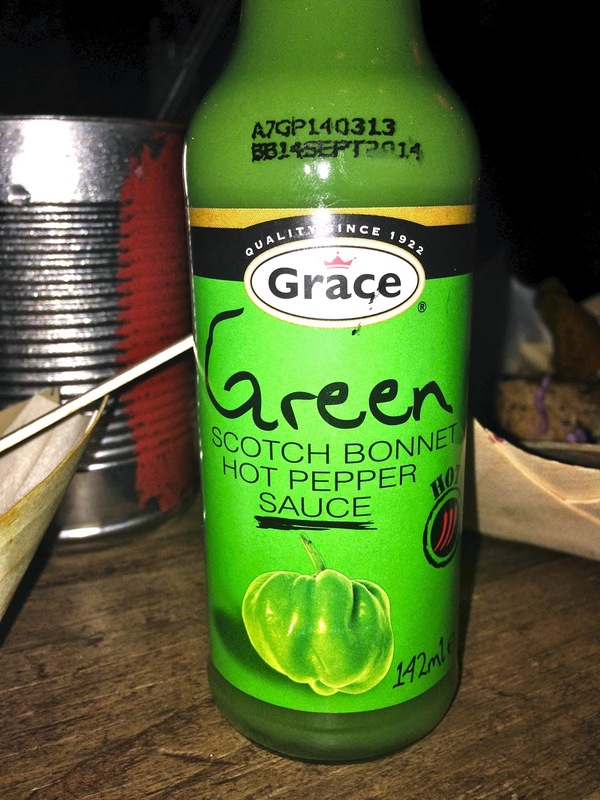 But I don't know about you, anything that says Scotch Bonnet Hot Sauce is not going anywhere near my food! 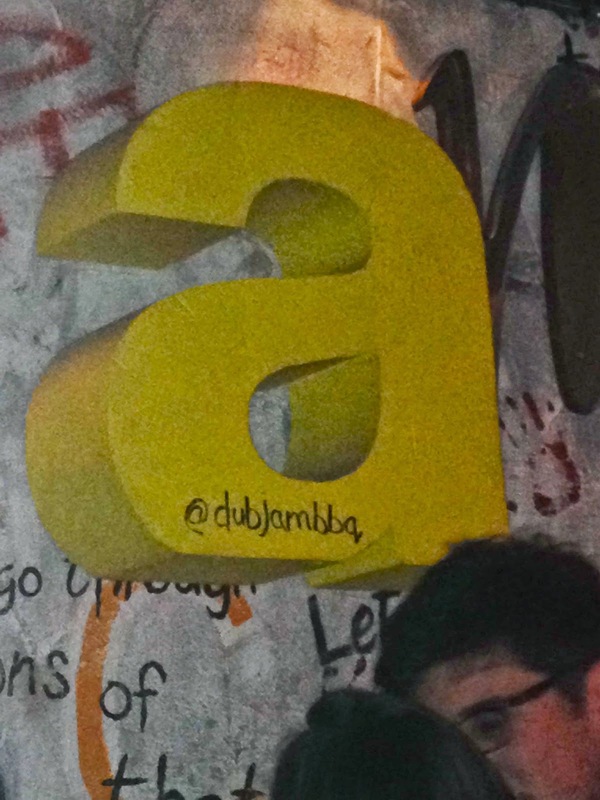 All in all this was a fab night out and the team at Dub Jam were brilliant. One of the guys even started doing some magic for us when it got a bit quiet, but it soon livened up again around 11.30pm when a group came in and there was dancing, laughter and rum punch all round! We reluctantly left in order to get the last tubes home, but I would definitely recommend adding a bit of Caribbean flavour to your night out in the near future. Maybe I'll see you down there, as Bob Marley says "Let's get together and feel alright."